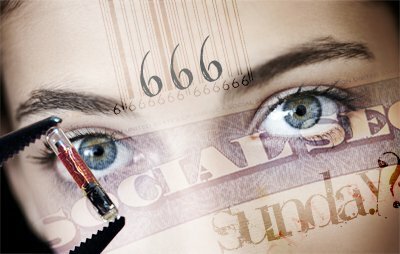 The Mark of the Beast: What it is & how to avoid it! Home Biblical Christian Articles End-time Prophecy The Mark of the Beast: What it is & how to avoid it! The dire warnings against all who receive this dreaded mark have inspired both fear and speculation in the hearts of many. It is widely taught that the mark of the beast will be a computer chip, surgically implanted under the skin, by a totalitarian government wishing to exercise total control over its citizens. Some have speculated the mark was tied to bar codes or even the social security numbers used in the United States. In fact, the beast's mark is much broader and far more menacing than bar codes, social security numbers or implanted RFID chips. Not just any geo-political power is symbolized in Scripture as a beast, however. Prophecy focuses on those powers which have warred against Yahuwah in the person of His saints. Thus, the beast which imposes a “mark” is also a world-wide power that will wage war against the Kingdom of Heaven just before Yahushua returns. As presented in The Beasts of Revelation 13 video series, the first beast of Revelation 13 symbolizes the papacy which, for 1,260 years ruled Christendom with an iron fist. The second beast of Revelation 13 is the United States which, by the sure word of prophecy, in the near future will enforce a “mark” of an image of the first beast. 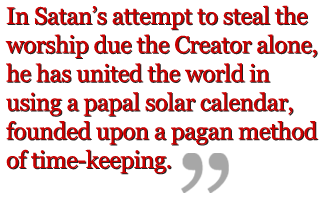 In Satan’s attempt to steal the worship due the Creator alone, he has united the world in using a papal solar calendar, founded upon a pagan method of time-keeping. Without the correct calendar, it is impossible to establish the correct day of worship. Thus, all who seek to worship Yahuwah but who calculate their day of worship by a false calendar are, in ignorance, actually paying homage to Yahuwah’s enemy. The mark of the beast is received when a person, with full knowledge of the truth, clings to false days of worship as more convenient in modern society than worshipping the Creator on His holy Sabbath, calculated by His original method of time-keeping, the luni-solar calendar. Some Saturday-sabbatarians have leveled the charge that Sunday worship is the beast's mark. It is. But so is worship on Saturday, or going to Mosque on Friday. Any effort to return worship on a day established by Satan, gives honor only to Satan. It is here that the mark is received. Yahuwah’s holy days cannot be found by any counterfeit method of time-keeping. Whether the current Gregorian calendar is universally accepted and enforced, or some future modification of it, the mark of the Papacy (beast) is received when one knows of the true Sabbath yet clings to worship days calculated by Satan’s counterfeit methods of time-measurement. From the 1920s-1950s, there was great agitation for a reform of the Gregorian calendar. In recent years, the proposal to revamp the calendar has again been raised. Whether Satan imposes the mark via the current calendar or some modified form is immaterial. The mark of the beast is received when Yahuwah’s sacred days are calculated by any other method than that of the luni-solar calendar established at Creation. In every culture and in every land, the mark may differ slightly. But it will be something which compels the conscience to rebel against the law of Yahuwah. It is simplistic to think that a dominating world power will have only one way to exert control across the wide and varied cultures of earth. In contrast to the beast's dreadful mark stands the seal of Yahuwah. The mark of the beast and the seal of Yahuwah stand in stark contrast to each other. One is a symbol of total loyalty to Satan and can be received in either the forehead or the hand, showing that some will conform for the sake of expediency. The seal of Yahuwah, however, is received only in the forehead, representing total surrender, loyalty and obedience to the Creator. Those who receive the seal of Yahuwah will have the mind of Yahushua fully formed within them. The seal of Yahuwah is revealed in obedience to ALL of His requirements, including worship on the seventh-day of the week, calculated by His original luni-solar calendar. The calendar is much more than just a method for time-measurement. The luni-solar calendar of Creation is an integral part of the divine law because without it, it is impossible to calculate Yahuwah’s holy days. All who live their lives in obedience to the divine law and receive the seal of Yahuwah will be regulating their lives by the original calendar, worshipping their Creator at His appointed times. No counterfeit method of time-keeping can be used to establish Heaven’s holy days. Thus, all who worship on days calculated by counterfeit systems of time-keeping, will receive the mark of the beast. The mark is received by any who reject full surrender to Yahuwah and refuse Him obedience. This is the mind of Satan fully formed within which is rebellion. All who receive the seal of Yahuwah, will be preserved from the destruction coming upon those who receive the mark of the beast. It should be the study of every person who desires eternal life, to know Yahuwah’s requirements. If the heart is stubborn and wants to cling to sin, there is a Saviour willing and able to transform even the hardest of hearts. 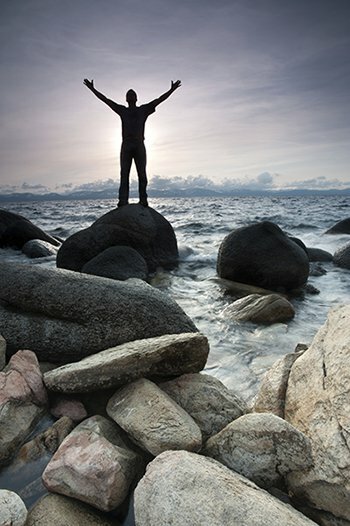 Now, while probationary time still lingers, choose to surrender your will to Yahuwah and obey Him, no matter what the cost. He will wonderfully transform the mind of all who come to Him in faith.